It is often accountants are called upon to convert cash basis accounting records to the accrual basis. 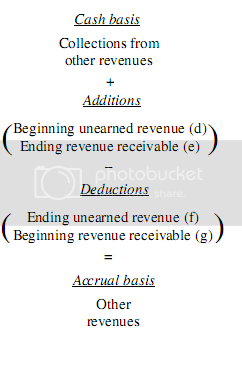 This post describes how to convert cash basis accounting record into accrual basis. GAAP requires the use of the accrual basis, yet cash flow information is also important to financial statement readers. On other hand, many smaller companies still use the cash basis of accounting, where revenues are recorded when cash is received and expenses are recorded when cash is paid (except for purchases of fixed assets, which are capitalized and depreciated). When making journal entries to adjust from the cash basis to the accrual basis, it is important to identify two types of amounts: the current balance in the given account (cash basis) and the correct balance in the account (accrual basis). The journal entries must adjust the account balances from the current amounts to the correct amounts. It is also important to understand relationships between balance sheet accounts and income statement accounts. 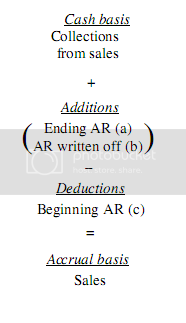 When adjusting a balance sheet account from the cash basis to the accrual basis, the other half of the entry will generally be to the related income statement account. Thus, when adjusting accounts receivable, the related account is sales; for accounts payable, purchases; for prepaid rent, rent expense; and so on. Assume a company adjusts to the accrual basis every 12/31; during the year, they use the cash basis. The 12/31/08 balance in accounts receivable, after adjustment, is $17,000. During 2009, whenever cash is collected, the company debits cash and credits sales. Therefore, the 12/31/09 balance in accounts receivable before adjustment is still $17,000. Suppose the correct 12/31/09 balance in accounts receivable is $28,000. This entry not only corrects the accounts receivable account, but also increases sales since unrecorded receivables means that there are also unrecorded sales. On the other hand, suppose the correct 12/31/09 balance of accounts receivable is $12,500. Sales is debited because during 2008, $4,500 more cash was collected on account than should be reported as sales. When cash is received on account the transaction is recorded as a credit to sales, not accounts receivable. This overstates the sales account!. Some problems do not require journal entries, but instead a computation of accrual amounts from cash basis amounts, as in the example below. (g) Beginning revenue receivable was recorded during the current period upon collection as revenue but was earned last period. 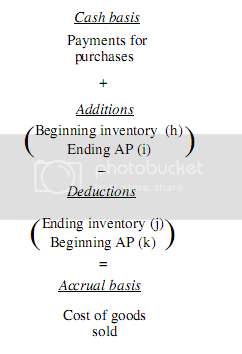 (k) Beginning AP reflects purchases last period which were not paid for or recorded until the current period. *) Provision must also be made for depreciation expense and similar write-offs and bad debt expense. 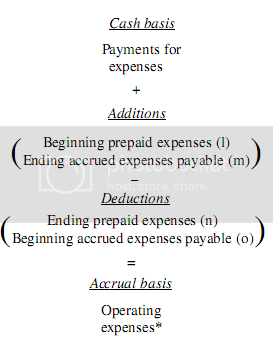 Since the accrual-basis numbers can be derived with T-accounts, you should not have to memorize the formulas.